It’s the tail end of strawberry season here in New England, one of my absolute favorite times of the year. The season is fleeting. The first local strawberries appear in early June, with crops peaking mid-month, then gradually tapering off as the 4th of July holiday weekend approaches. Growing strawberries is hard work, and almost before you know it, they’re gone, and summer crops are in full swing. During late spring and early summer visits to local farmers markets only recently reopened for the growing season, strawberries are one of the first bright spots of color in a sea of hardy leafy greens. They play a part in bringing the New England area fully back to life, with countless strawberry-related activities: strawberry plant sales at garden stores, pick your own days and festivals at local farms, and the always delicious Mass Farmers Markets Strawberry Dessert Festival. This year, we are especially lucky to have enjoyed the large and tasty local crop. The weather has not cooperated by following any sort of pattern (although really, what else is new? ); rather it has been a study in extremes – a mixture of chilly, rainy days with sweltering heat and sun. We’ve sort of stumbled into summer, but thankfully the fragile fruit made it along with us in all its sweet, juicy glory. On Saturday, a group of friends and I made our way to the Verrill Farm Strawberry Festival in Concord, Massachusetts. It was another gray, drizzly day in a week of grayer, drizzlier days, and just warm enough to make everything feel sort of sticky. A number of rugged folks picked their own in raincoats and mud boots, sloshing through the mucky fields to find the best berries. We were landlubbers and enjoyed the festival on solid ground, partaking of the fantastic strawberry shortcake made on site (strawberries served with a buttery biscuit and real whipped cream, the classic New England way; biscuit recipe here [pdf]), fun music, and the excellent farm stand. The Boy and I couldn’t stop ourselves – we bought several quarts of perfectly ripe strawberries and proceeded to eat them for the rest of the weekend. Because while strawberry lovers can freeze, dry, and can the fruit to preserve as much of the early summer joy as possible, there is really nothing like eating a perfectly ripe, local strawberry, fresh from the vine. 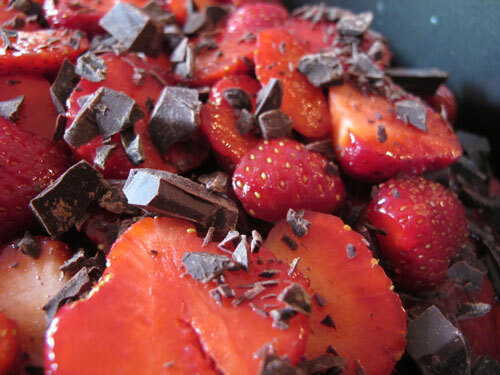 And what better to eat strawberries with than chocolate? Here’s a simple, refreshing recipe that highlights the finest qualities of ripe, seasonal strawberries paired with dark chocolate. It’s a novel take on a classic combination. Adapted from Colleen Patrick-Goudreau’s The Joy of Vegan Baking (a must-own cookbook, in my humble opinion). Prepare an 8- or 9-inch circular tart or springform pan by very lightly coating with canola oil cooking spray. Grind nuts in a food processor or blender until they resemble a coarse meal. Add dates and salt into nut mixture, then process or blend until thoroughly combined. Pour mixture into pan, then press into the shape of a crust. Set pan aside. Soak 5 pitted dates in warm water for 10 minutes, then drain water and gently dry dates on towel. Separate 1 C of whole strawberries and set aside. Slice 4 C of strawberries, then arrange sliced strawberries on the crust, reserving a small number to adorn top of pie. Set pan aside. 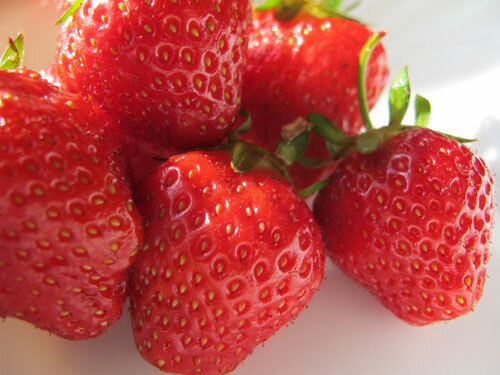 Place the reserved 1 C of whole strawberries in a food processor or blender and process until pureed. Add soaked pitted dates and 2 t lemon juice to strawberry puree and process until smooth. Pour strawberry puree mixture over the sliced strawberries in the pan. Decorate the top of the pie with reserved sliced strawberries. Prepare chocolate chunks (I chopped up leftover bits of several different dark chocolate bars) and sprinkle over top of pie. Refrigerate entire pie for 1 hour before serving. Storage: This super fresh dessert is best when eaten right from the refrigerator after the 1 hour setting time. If you somehow manage to maniacally restrain yourself from finishing it, however, it can be stored in an airtight container and refrigerated overnight. oh god this sounds amazing! !